That partisanship is likely to intensify as the 2016 election gears up. And as with the fight over the Export-Import bank or trade, partisan tension brings into stark relief intra-party divisions — so much so that Frank, speaking at an event in Washington, D.C., Monday, predicted the Fed will be a central issue in the presidential primaries. Will Super Mario save Europe’s bacon? But Stanford Law School fellow Peter Conti-Brown kicked off the conference with a separate, more specific gripe outlined in a Brookings’ working paper: those 12 regional banks that make up the Federal Reserve system? “They’re the gallbladder of the U.S. financial system,” he said, and “they need surgery” so that their presidents are less cozy with private banks. He’d prefer to see the Washington, D.C.-based Board of Governors, or even the President of the United States, appoint the presidents of each regional bank (currently, presidents are appointed by the board of directors of each bank subject to the approval of the Board of Governors of the Federal Reserve System). “What would presidential appointments accomplish?” asked Charles Plosser, former head of the Philadelphia Fed, on his first day of retirement. The regional banks, Plosser argued, help protect the Fed from dangerous political pressures, of the sort being batted around on the Hill. Apart from “Audit the Fed” itself, there are several reasons why the current climate is so rancorous, said Brookings’ Senior Fellow Sarah Binder. In general, tensions over the Fed tend to be countercyclical. When the economy is not doing so hot, the Fed is a frequent, even if misguided, target of scrutiny from the Hill. Attention on the Fed is even more heightened now, Binder explained, because the current zero interest rate policy necessitates unconventional monetary policy that’s naturally more suspect. But it’s also “just a period of intense partisanship,” she added — one that’s complicated by divides between House and Senate Republicans. But wait a minute, said John Taylor (of the so-called “Taylor Rule”), speaking from the audience: There’s no question the partisanship is as extreme as ever, but who says the dual mandate is causing the split? Eliminating the employment mandate isn’t even on the table, he said. Charles Calomiris: If high inflation is not here yet, why should the Fed change course? Maybe not, Frank said. The former legislator and co-author of the Dodd-Frank financial reform bill lost no time summoning his inside-the-beltway cred by suggesting he knew that’s what lawmakers on the right discussed among themselves. “Audit the Fed” is just a “proxy,” he said. “Nobody thinks Janet is pocketing money.” Conservatives’ “vehement objection” toward the dual mandate, Frank continued, is genuine; but it’s rooted in the belief that the central bank is too activist and not devoted enough to curbing inflation. But for all the partisan bickering, anyone who watched lawmakers trying to question Yellen during last week’s congressional testimony — whether it was Senate Banking Committee Chair Richard Shelby or Sen. Elizabeth Warren — could see some truth in Taylor’s final point: “These issues are arcane.” They don’t lend themselves easily to partisanship, he added. Which no doubt means, with Congress on the eve of another national election, that lawmakers will find a way to make the complicated and arcane even more partisan. 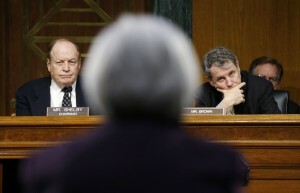 Left: Federal Reserve Chair Janet Yellen delivers her "Semiannual Monetary Policy Report to Congress" before the Senate Banking, Housing, and Urban Affairs Committee, including chair Richard Shelby, R-Ala., and ranking member Sherrod Brown, D-Ohio, on Feb. 24, 2015. Photo by REUTERS/Kevin Lamarque.